We specialize in writing high quality academic papers in shortest periods of time! Liked the samples? Don't hesitate to place an order and receive a top notch paper of highest quality, written specially for you by one of our professional writers! At RushMyEssay.com we truly appreciate that a great deal of the students who come to us for essay writing help are on a budget; and feel that every student, no matter how tight their budget is, should always be able to get the writing help they need. That is exactly why we offer affordable essays and various discount options in our flexible pricing plan that will fit any student's budget and writing need. Hamlet Soliloquy Analysis - Did Hamlet have a Death Wish? 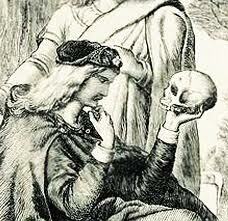 In what is arguably the most famous Shakespearian soliloquy, Hamlet ponders the fundamental question of life and death in deceptively simple language, "To be or not to be, that is the question..." His question is much more complex, layered, and darker than simply wondering the meaning of his existence. Any Hamlet soliloquy analysis has to examine not only the words which Shakespeare penned for his tortured hero but to the rhythm, cadence, and context as well. Did Hamlet have a death wish? That indeed is the question. Our analysis below will help you in understanding Hamlet. Hamlet's soliloquy is delivered in the third act, an act that opens with his uncle Claudius plotting with Polonius to spy on Hamlet. As in any Hamlet soliloquy analysis, it is worth considering if the character is expressing these thoughts for effect before assessing Hamlet's words and interpreting them as a desire for death. Is he aware that he is being watched? Does he emote more dramatically to convince himself of hated towards his uncle? After all, this is the man he blames for his father's death and curses for marrying his beloved mother. Or does it indicate that he is mad or at least on the way to madness? Regardless of who he thinks might be listening, his words are the most important component of Hamlet's soliloquy. The lines are laden with imagery about death. Hamlet is depressed and unhappy because his father died and because of his own failure to avenge his father’s death by killing Claudius. Taking his own life is clearly at the forefront of his thoughts. He imagines he has a "sea of troubles" but can "end them." He berates himself for his cowardice in not confronting Claudius but his anger is perhaps more directed at being too cowardly to take his own life. He asks if death will bring oblivion, which he believed would be something to sooth his tortured mind and soul. However, he cannot convince himself that this would be a viable solution. "To sleep: perchance to dream: ay, there's the rub; For in that sleep of death what dreams may come." There is, of course, only one way to find out if death brings oblivion and Hamlet is unable to take that final step, "But that the dread of something after death, The undiscover'd country from whose bourn No traveler returns, puzzles the will." Hamlet's anguish over his own indecision is obvious here. Only death, either his own or that of Claudius, can release him from his anguish. But his fears of the consequences of either action haunt him to the point of paralysis. It can be concluded after this soliloquy analysis that Hamlet does have a death wish but, more importantly, he also has a desire for life. Are you looking for an essay on this topic? You can easily order it from us. Our writers will be glad to help by providing you a custom-written paper with your specific requirements. Topic: Great Leaders: Are They Born Or Made? Topic: Is Gender Discrimination Still a Problem? Topic: What is Assisted Suicide? Topic: Who were the Big Three in WWII? I was really tensed because I had to submit my research paper within one day but I am really thankful to rushmyessay.com. I was impressed by the way writer gave special attention to my requirements and demands. The work provided was professional. The writer did care of all the special requirements I wanted to see in the research paper. I was overwhelmed with work, and rushmyessay.com saved my grade! They got my work done on time, which is all I needed. I wanted a passing grade and I got one. The prices were just right, and the customer support people were nice. I will use this service again and I have told my closest friends about it. Thank you for keeping your confidentiality promise. I was genuinely worried that your service was some sort of trap, or that you may leak the fact I used your service. You kept my secret, thank you!